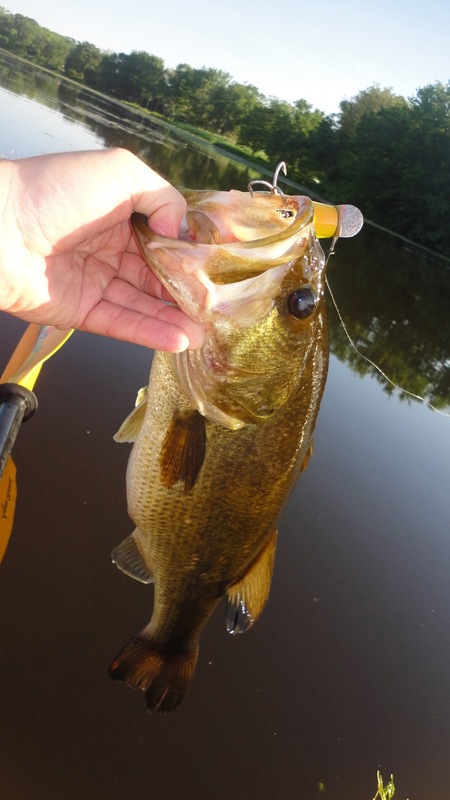 Choopy Lures: Bigger Baits = Bigger Fish? Bigger Baits = Bigger Fish? Since I have rekindled my freshwater fishing habit, I use it as a good excuse on nights or morning where the moon scares me from the surf. On the dreaded supermoon, I decided to test the theory that largemouth bass like the full moon. I launched the kayak at 4 AM ready to fish for some largemouth. The moon was bright, and barely needed my light at all. The first 45 minutes were in "darkness' and I threw frogs, 3" pikes and a small popper without any bites. So much for the generic rules of fishing. To the east the sun wasn't peaking, but the sky started to turn from dark, to gray, and the fish started to respond. I was fishing some weed lines where the millfoil was starting to reach the surface, but it was sporadic enough in spots where you could still fish poppers, 3" Pikes, lil Barky's and other swimming lures. I have a lot of confidence in my lil popper in these conditions and it was the workhorse this morning as well. I caught a few largemouth, and missed a few others while fishing the lil popper on the edges of the millfoil. I switched over to the 3"Pike as the light increased and the largemouth responded to that as well. The fish weren't huge, but they were all 1 to 1 3/4 pounds. I drifted over to a favorite set of lilly pads and caught one of my "pets". There is an area of clear water that the pads border, I switched over to 1 1/4 oz Danny hoping to find a larger bass cruising the edge of the pads. The theory partially worked. On my first cast, another largemouth, sized like all the others, struck the danny and came undone at the top of a pretty impressive jump. After a few more casts, I started the drift back to the truck. I threw 3" Pikes and 1 1/4 oz Danny at weed clumps and lilly pads. I found another nice spot with some open water and millfoil on one side, and pads on the other. I set up my cast and on my first cast landed another cookie cutter largemouth. I waited a couple of minutes and put on the 1 1/4 oz Danny. I had a feeling there were a few fish here and hopefully a bigger one. I hoped the spot settled down enough and retrieved the danny a couple of inches below the surface. A nice bass came out of the millfoil and swirled at the danny, luckily finding the hooks. A short fight and the pool winner of the day was in the boat, a good looking 2 lb 11 oz largemouth. Again, I let the spot settle down, but couldn't hook another fish there. I paddled my way until I found another spot of open water. First cast with the 1 1/4 oz. Danny, and another nice bass came off the pads and struck the danny. It was towards the end of my cast, so I had to really horse this one threw some weeds and luckily kept it on the surface. I have lost one too many fish letting them bulldog their way down into the weeds, and in the kayak I find it hard to keep their head since you lose that leverage you have in a boat. A short tussle and a 2 lb 7 oz. largemouth was in my hand. I was running a bit late at this point, and had a lot of confidence in my yellow perch danny, so I fished my way back to the truck quickly. No more fish to show for it though. On the drive back I thought about the old saying of bigger baits = bigger fish. I think there is a lot of truth in it, sometimes. On this morning, it was definitely true to the cliche.